Create a text link in WordPress to an external website, an email address or to an existing internal page. Step by step WordPress tutorial for beginners, by Kaydee Web. Have at hand the URL or email address you want to hyperlink to. Notice the link icons in your tool bar. The link buttons look like the links of a chain, as circled in red below. The link icon to the left is the WordPress CREATE/EDIT LINK icon. This adds a new link or allows you to edit a link. The icon to the the right is the WordPress REMOVE LINK icon, and will clear the link. Place your cursor just before the first word. When you click down, hold and drag to the end of the word or sentence. Double click a word to highlight it, hold the mouse down. Continue to highlight the following words by clicking any where on them. Double click a word to highlight it. Hold shift down and use the arrow key to tab right, highlighting more words. 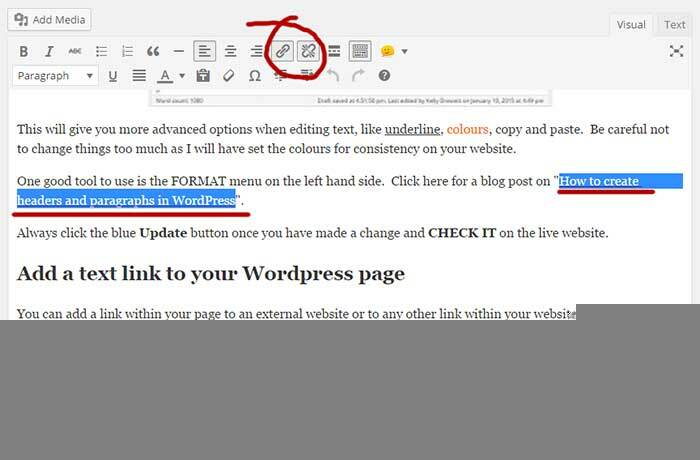 With your text highlighted now click the WordPress INSERT/EDIT LINK icon. Typing or pasting the website address or email address. NB. If you want to link to an email address type mailto: before the address. Or by selecting a specific page on the site, when you start typing the the page title. Now hit the blue RETURN button. It is a right angled arrow, if you are unfamiliar with it. Always save the page once you make an edit. More advanced options are available when creating text links. To find these options on a new text link, just highlight the text then click the ADD/EDIT LINK icon. Then click the cog. To find these options on an existing text link, click anywhere on the link, or highlight the words. WordPress shows you the linking page or URL. Click the PENCIL icon, once the box changes click the cog. A box appears, in which you have many more options for your text link. In the first field labelled URL, type or paste your external website address (https://) or email address (mailto:). The second field, “Link text” will change the text displayed on the page. Open in new tab: will open a new tab when the user clicks the link. Guidelines within Google prefers that you do not force users to open links in a new tab. The user should be able to make their own decision. This follows Googles clarity rules. The search field labelled search, just under “Or link to existing content” enables you to search the pages and posts that exist on your website, making it easy for you to create internal links. Remember to save and then check that all the links work correctly on the front end of your website. Once on the front end, refresh the page so you can view the updates.